What Guests Are Saying About: Sue’s Serenity | Crystal Water Villas Blog - Lake of the Ozarks! This wonderful family retreat resides in the middle of a subdivision on a dead end road – offer great privacy for any family retreat. 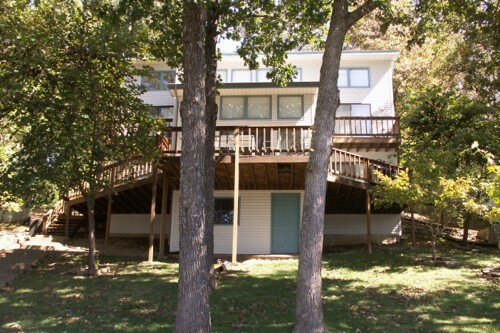 The home is nestled in the trees and yet still takes in the great view of the water and main channel activity – 8 mile marker of the Osage and within the very desirable Buck Creek Cove. The home has a vaulted ceiling, oversized windows, balcony views of the shaded lot and provides guests with three spacious bedrooms, and two full baths. What guests have said about their stay at Sue’s Serenity..